There is ample on street parking around Boulevard Seafood Company NYC. Parking meters need to be fed until 10pm. Please be aware that the city is very diligent about ticketing. On Sunday, the meters do not need feeding, so come enjoy our bountiful Upper West Side Brunch. The #1 Train stops at 103rd and 110th Streets. Boulevard Seafood Company NYC is a three-minute walk from the 103rd Street stop and a five minute walk from the 110th Street stop. The M104, the M116 and the famous LaGuardia Airport bus, the M60, stop at 106th and Broadway, putting you right on our block. 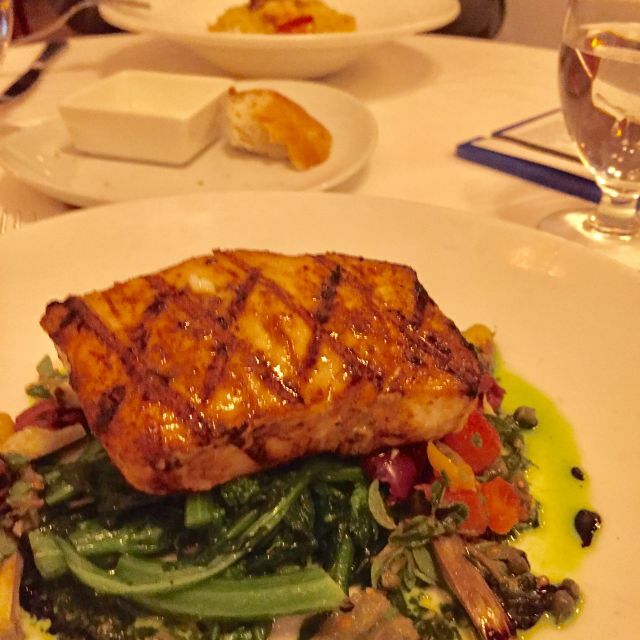 Boulevard Seafood Company is a contemporary American Seafood restaurant located on Manhattan's Upper West Side. Our fish is purchased on daily trips to the Fulton Fish Market, with our Chef selecting a broad array of both fin fish and shellfish. Our gracious and spacious Dining Room, Bar, and Sidewalk Cafe are designed after the Pasadena, CA. Arts & Crafts masterpiece, the Gamble House. We serve an extensive menu of contemporary seafood and American bistro food for Lunch, Brunch, and Dinner. Our bar offers an exciting craft cocktail list, twelve draft lines, and wines by the bottle and glass. Boulevard Seafood Company is open every day of the year, except Christmas Day. Charming restaurant with excellent service and atmosphere. The restaurant manager came by our table regularly to ask how the food was and if we needed anything. The food is very good and the wine by the bottle is reasonably priced. We’ll definitely go back. Need to salt fish or put salt on table don’t be cheap with tartar sauce make wine glasses larger, don’t put extra dining tables on top of customers. I thought the food was just ok. Not terrible, but I won't go back unless someone really wants to go there. In fairness, I felt the same way about Henry's. People loved it, but I never had a good meal there. Pretty forgetful table server. Inexperienced, so forgiven. Second visit to Boulevard is better than the first. So great to have a neighborhood (for me) spot that has every indication of lasting. The scallop appetizer was delicious - two perfectly cooked sea scallops enveloped in a very tasty melange of lentils, apple smoked bacon and a celeriac froth. Duck spring rolls are my go to forever. Mains - swordfish and arctic char. I ordered medium and will adjust to medium rare next time. Mashed potatoes with arctic char were creamy and comforting. Wine selection is excellent. no room for dessert, but maybe next time. happy hour oysters and cocktails, lunch or dinner. Casual and excellent. A new neighborhood go-to. This is a neighborhood gem, friendly, reasonably priced, sound level moderate because Upper West Siders like to talk to each other over the table, featuring delicious fresh seafood (though the menu says carnivores have some choices too). I liked its predecessor, Henry's, but I'm coming to cherish Boulevard Seafood. We have been here many times since it reopened (from Henry’s). We usually have cocktails and share some “small plates.” Interesting variety and quite good. Main courses: grilled salmon and burgers are excellent. Only complaint: we were meeting friends who arrived first and were seated. It was windy and cold out. The table was near the back next to French doors that were not closed tightly nor could they be. My husband explained to the hostess it was quite cold because of the draft and requested a different table (it was very early so there were plenty of empty tables); however, she seemed perturbed and came back to our table (we were now standing) and pulled the heavy, dark velvet drape over the windows which now made the area dark (but not in a good way). I said it would not do. Still with attitude,she said we could choose another table of which there were many with the caveat “not one that was being set up” — as if we might. Her attitude was unnecessary and surprising since the staff has been lovely every time we have been there (I would guess at least 6 times). We have now been to Boulevard 3 or 4 times and it does not disappoint! This time was dinner for my husband's birthday.. oysters, crab cakes, lobster risotto. He had a fabulous spicy bloody mary and I had a great rosé. Too full for dessert but choices sounded fantastic! Already looking for opportunities to return. Well done! From menu to presentation, it all works seamlessly. Really very good food in a casual atmosphere served by what is clearly a seasoned & professional staff. Must come back for Happy Hour. Boulevard Seafood was previously Henry's. I am a longtime Henry's fan who tried Boulevard Seafood for the first time last week. I was not disappointed. It has many of the menu items from Henry's I loved best and new ones that make the overall menu even better. The ambiance and service were wonderful and it remains a good value. I will definitely be back. Love the corn chowder w shrimp. Service is mostly very good. But some reminding was necessary. Greeting couldn't be nicer. Shown to table with joy and welcome. Excellent service, cheerful, accurate, helpful, timely — delightful waitperson. Food superb. Corn chowder excellent. Only thing I might have wanted to be aware of was that the sauce and garnish on the crab cakes was very similar to the corn chowder. One should not order both, if you want a variety of tastes. Otherwise all was great and I will be back! The food and ambience are always very good. The "private dining" from the generous separation of the tables is special. However -- the service is always suspect. The waiters seem not to have one staton, so they are all over the place, often hard to find. No one seems responsible for your table. I asked four (4!) different waiters for bread, with no result. I had to speak with the manager to get bread. This is not atypical at the poorly managed Boulevard Seafood. It is great to have a terrific seafood restaurant on the UWS. Boulevard's fish are fresh and imaginatively done. Nice collection of inexpensive wines. Worth a visit, or more. The appetizer salmon poke or poque was delightful, citrus and other flavors mixed. Original, fresh. Unusual. The best thing is the space, breathing space, room to converse pleasantly with companions while enjoying a fine dinner. Don’t change this! food excellent, very good service, altho had to ask for lemon and bread a few times and the busboy was a little TOO attentive - almost lost one of my unfinished plates! Candles are TOO atmospheric. Could not see food at all. Otherwise, ambiance is similar to what it was with Henry's - which is why we keep on going back as our neighborhood restaurant with friends! Superb seafood cuisine. The chef is a genius at combining unexpected ingredients with the greatest of skill, and a talent for surprising the palette in the most delicious ways. I had a rich guilty-pleasure seafood risotto that led me miles off my diet, but was worth it with big rich chunks of lobster and plenty of shrimp in creamy rich rice steeped in truffle oil. (Only one scalllop though. Would have loved another.) On the other end of the scale, a perfectly fine kale salad to start, with grapes, almonds and parmessan. My partner had the excellent salmon, and in previous visits I have had a wonder meaty Arctic char. Everything is worth a try, and the wait staff if friendly and efficient. Happy to snag same day reservations. Our second time at this new restaurant that used to be Henry’s. We all enjoyed our dinners and the restaurant very much!!! We will be back!! This place which used to be the place to go when you wanted to be able to talk to each other at your table now has loud music and a noisy bar crowd which completely changes the ambiance and noise level. I suppose it's better for young people, but not so good for the senior citizen. The Buffalo Shrimp are major winners! Noise level allows for a Real Conversation. It's a comfortable restaurant, and the food is good. However, no bread was served and the decaf coffee was poor. My most recent visit to Boulevard Seafood was particularly enjoyable. My friend and I enjoyed our food, as we have on most of our previous visits. The service was friendly and courteous and the service was a bit more efficient than it was on our previous visit (perhaps because the restaurant wasn't terribly crowded). We noticed there were some new items on the menu and I tried and greatly enjoyed a dessert I hadn't had before (tiramisu). Really delicious food, and nice presentation. They had one of our favorite (hard to find) Italian wines for a good price. It was all a pleasure - and Calvin, our waiter, was perfect - attentive, warm, helpful. Friendly service and great lighting. You need to offer some kid choices. Replacement for Henry’s is wonderful! Lots of interesting dishes both small and large! A little pricy, but seafood usually is! Every time I eat here I find something new that’s superb. This time it was the white chocolate bread pudding. I’ll be back again soon. Best restaurant in the area by far. The food was absolutely amazing. My husband and I got the oysters and duck spring rolls for appetizers. I must say it was AMAZING!!!! Our entire meal was fanrastic. The servers, the host. It was a perfect date night out!! I would reccommend to my friends. I've been to Boulevard Seafood numerous times since it opened last autumn. The restaurant offers very attractive and comfortable surroundings, friendly service, and very good food. It's become my restaurant of choice when I dine with a friend who lives in the neighborhood. We usually get together about twice a month, so we've had the opportunity to sample a variety of dishes. Some we've liked better than others, but we've enjoyed every visit. Waited 1:20 for food. Entrees came out before appetizers. White wine was warm. Busboy spilled ice water in my swordfish. Waitstaff was lovely and apologetic but overwhelmed. The food getting to us was a bit slow. Other than that the experience was goo. Chopped Seafood platter was delicious. Service was very good. Wine list a bit weak -especially the whites. Ambiance- decor hasnt changed from previous owner - henry's. Warm and welcoming but could use a refresh. Good to find that this neighborhood favorite is still delicious and good value. Excellent service. Fresh seafood and daily special is usually meat or chicken.